Much has been said and written about trans people by theologians and Church leaders, while little has been heard from trans Christians themselves. As a step towards redressing the balance, This Is My Body offers a grounded reflection on people's experience of gender dissonance that involves negotiating the boundaries between one's identity and religious faith, as well as a review of the most up-to-date theological, cultural and scientific literature. 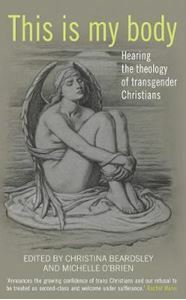 The book has been compiled and edited by Christina Beardsley, a priest and hospital chaplain, writer and activist for trans inclusion in the Church, and Michelle O'Brien, who has been involved in advocacy, research, lecturing and writing about intersex and trans issues. It includes contributions from many people associated with the Sibyls, the UK-based confidential spirituality group for transgender people and their allies. "This updated edition of Bornstein's formative My Gender Workbook (1997) provides an invigorating introduction to contemporary theory around gender, sexuality, and power. The original is a classic of modern transgender theory and literature.